The Pinnacles, also known as “Boone County Pinnacles Youth Park” is a Missouri State Designated Natural Area located approximately 12 miles north of Columbia. 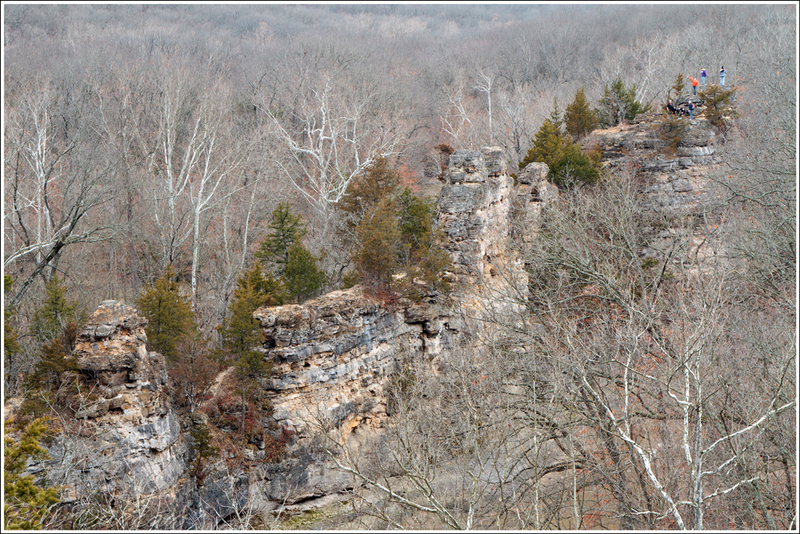 The geologic structures know as The Pinnacles formed between two parallel Ozark streams, Silver Fork and Rocky Fork. These streams running closer and closer to one another have formed this erosional structure (senile ridge) that is approximately 75′ high and 1000′ in length. The Pinnacles are composed primarily of Burlington Limestone, with a small amount of sandstone to act as a “cement” in some places. This fact was the inspiration of the title of this post. These two streams are quite quickly, in a geological perspective, eroding this separation between them. Limestones are very easily eroded by forces of weather and flowing water. On this visit I easily found fossil crinoids in the rock, a feature Burlington limestone is known for. The most recent time I visited here the weather was quite poor. 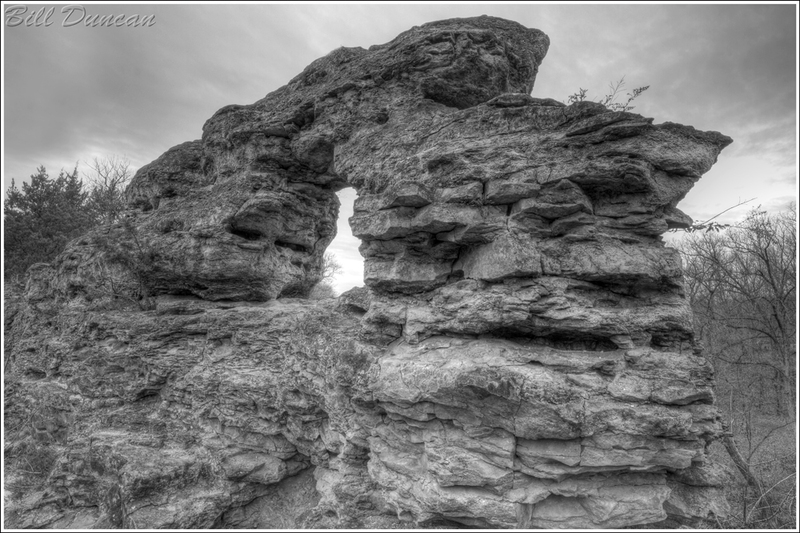 During one of the sporadic sleet and freezing rain showers I took shelter under one of the windows, or natural arches, that erosion has carved in the rock. While I was waiting out the weather I was able to take a close look at the composing rock. The amount of cracks and other signs of erosion was eye-opening. While I was sitting there, bits and pieces of rock were literally falling off the overhanging arch and landing around me. It takes little imagination to realize the effects that changing mid-western seasons along with ebbing flows of the streams are having on this feature. Geologists reckon this rock feature has only a couple thousand years left, so if you plan on visiting, do it soon! If you do plan on visiting and bushwhacking your way across the stream and up onto the rocks, take care! There are numerous spots that one wrong step could potentially be your last. 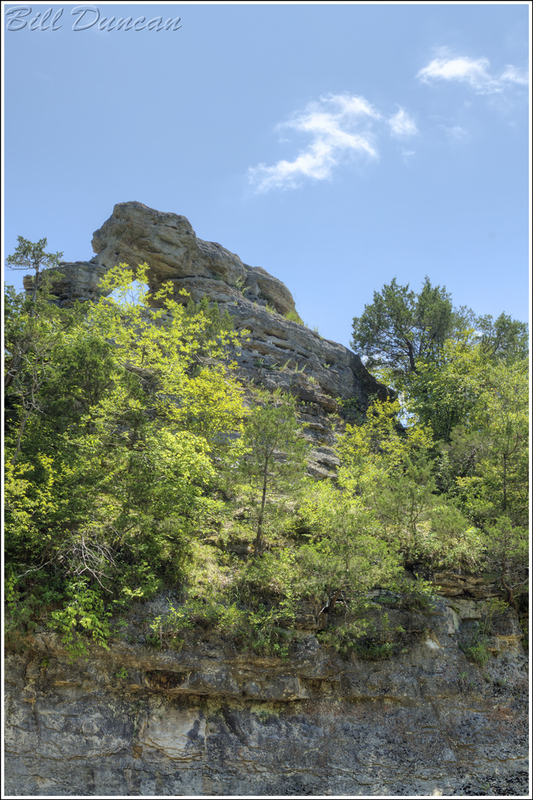 On top of the risks of being swept away by high water in crossing the stream and falling from the top of one these spires, there is the usual risk associated with the Northern Missouri Ozarks – private property. Apparently one side of this site is bounded by a stretch of property owned by a particularly cranky old man. I was warned by a regular visitor to stay clear of that side of the park as he will not hesitate to accost hikers that stray too far. Unfortunately one of the two shallow spots I have found to cross the stream is located in what seems to be his property. The eastern red cedar, which is really a juniper, loves limestone. This species is a long-lived pioneer invader that will be one of the first trees to grow in a disturbed area or any area that other species find undesirable. Because it will grow in crevices along bluffs and shallow, rocky soils that often lack resources needed to grow quick and large, small trees can often be over 600 years old. In fact, the oldest documented individual of this species was recorded in Missouri and was found to be 795 years old! This species is currently taking over much of Missouri’s knob-top glades found throughout the Ozarks. Cedar is not tolerant of fire and the suppression of natural and man-made fires on modern private land as well as public lands such as the Mark Twain National Forest is allowing cedars to take hold in these habitats where they were historically controlled. But, this is a subject for another post. Just a stone’s throw south of The Pinnacles is a “shelving rock” style of shut-in (not pictured). 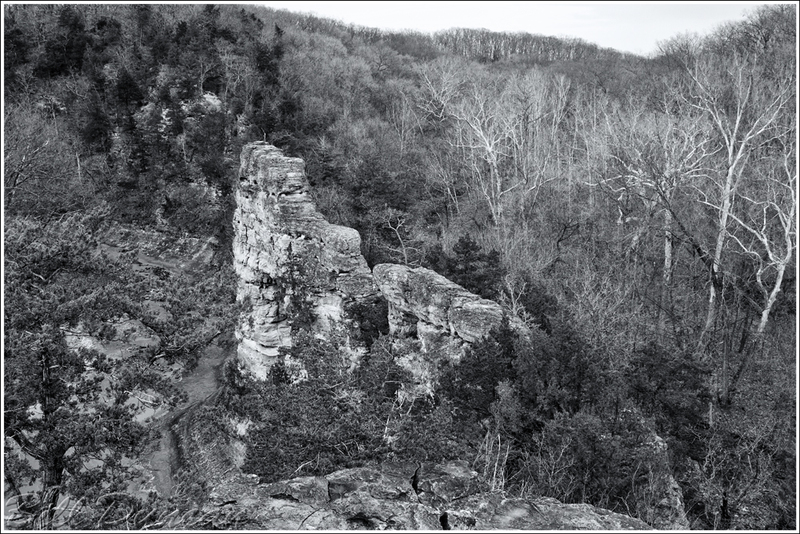 This feature was formed by erosional forces of Silver Fork as the creek runs dead-on into limestone bedrock and is forced to make a sharp left turn. This shelter is 40′ deep, 10′ high and 125′ long. Although it looks like the shelter is often flooded during high waters, I am sure this was used by pre-Colombian man. The Pinnacles is another destination for the landscape photographer in the Missouri Ozarks that offers a diversity of photo ops depending on time of day, weather and the season. It is also a high quality biological habitat even though it is so close to a a major metropolitan area. 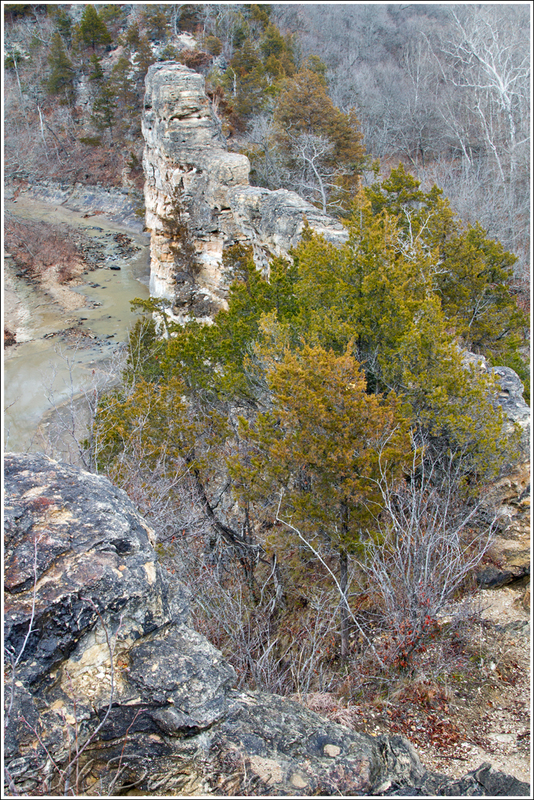 With luck and continued proper management this location will continue to be a place visitors can come to appreciate the geologic and natural features that the Missouri Ozarks offers and once offered in much greater abundance. Much of the information used in this post was found in “Geologic Wonders and Curiosities of Missouri” by Thomas R. Beveredge. This is a highly prized book in my collection. I only wish someone would update and revise with GPS coordinates! Thanks for sharing this informative article. This was a great writeup of the place. Once again, I had no idea there was anything like this anywhere near here. You have a knack for finding these gems. Perhaps you should do a book. Seriously, I can’t think of anyone who knows more unique places in this area than you. Thank you, sir. Maybe in another ten years or so when I’ve visited more places and have more material. This is a good idea.